A swarm of bees had flown through the Cub Scout’s day camp near Lake Sammamish in Issaquah, and was perched on a maple tree branch over their archery range. The camp director was very happy to see me when I arrived, and immediately asked if I could wait about 20 minutes so the boys could watch. That’s a question a homeschool parent will never turn down! After the Scout’s closing ceremony, everyone was moved over to the archery range, and sat down on the grass about 40 feet from the bees. I gave a 5 minute talk about the bees, explained what was happening and how I was going to take them home with me. I answered a handful of questions, then zipped on my veil and climbed up the step ladder under the tree. Everyone was silent as I trimmed the twigs, and raised the box up to the cluster of honey bees. A quick shake of the branch made them all fall neatly in. It couldn’t have been a better performance! I left the box on the ladder for any flying bees to enter, and returned to the applauding croud. The camp director later told me she had never had so many boys silent for that long. The boys got a memorable lesson about bees, I got another hive going, and it felt like I accomplished something significant for the day. I think it must be time to make a change and get away from my cubicle job, so I can make every day’s work be meaningful like this. 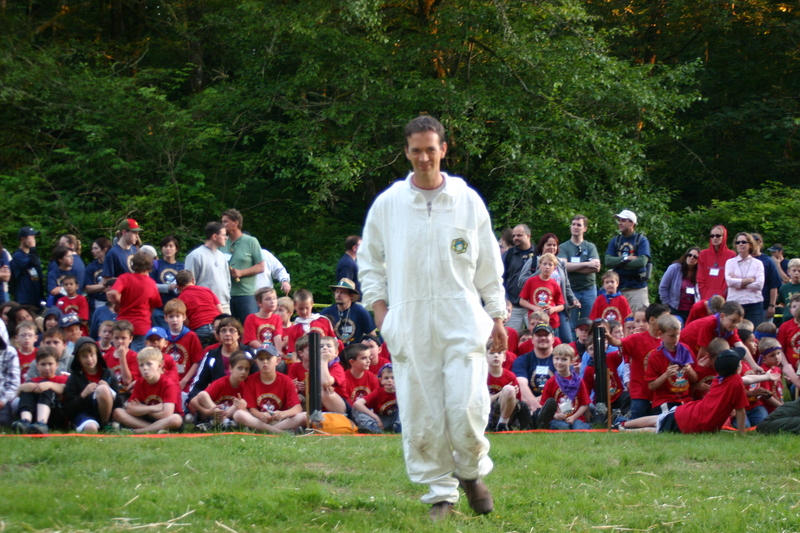 This entry was posted in Beekeeping and tagged Beekeeping, Homeschool, Swarm catching. Bookmark the permalink.